Glutathione has been a major part of my progress for the last 2.5 years. If I go more than 5-7 days without, I start going downhill. Fast. It is the reason I can walk again and communicate using words again. I have learned a tremendous amount on the subject. My Neurologist, Dr. David Perlmutter, pioneered it’s use almost 20 years ago for many intense Neurological conditions. He has since taught and/or consulted with a great many physicians on the use and administration of Glutathione over the years. There are many forms out there. From pills to suppositories, inhalers, etc. BUT… the ONLY way for your body to get and use additional Glutathione is through IV. Period. I have heard a few people suggest they had a less than plesant experience with Glutathione. From personal experience I am certain incorrect handling and/or poor product is the cause. I have personally had bad experiences early on. I had begun to urinate blood (a LOT of blood) immediately following my first few Glutathione IV’s from a Dr in Chicago. After several doctors and a hospital stay failed to figure it out, I went to the Dr’s office and inspected his Glutathione supply. It was from some obscure pharmacy and was not only oxidized but also expired. Glutathione is very sensitive to both light and heat. Proper handling is paramount. That means from the time it leaves the pharmacy until it reaches your bloodstream. Moreover, there is ONE place and ONE place only that I feel should be a source of Glutathione. Wellness Pharmacy is where Dr Perlmutter has his compounded. As you all can certainly understand, I was not interested in trying anything other than what has been proven to work. That meant for me, I would only get it from the pharmacy that patented it’s creation method. Wellness has patented the method for creating 100% reduced L-Glutathione. Once I switched to the pure form compounded there, not only have I had ZERO issues, it’s potency is dramatically higher than the others I’ve experienced. The correct way to prepare and administer Glutathione is through an IV push (NOT injecting Glutathione into a 500ml bag of saline!). It is important to dilute with 10ml of Sodium Chloride into a syringe. My dosage generally is 3000IU of Glutathione, diluted with 10ml of Sodium Chloride. Glutathione is your body’s “Master Anti-Oxidant”. It is a naturally occuring substance that is largely responsible for your overall health and function. Among the many things it does, one is it’s arguably the most effective scavenger of free-radicals. The little evil-doers that attack your body and brain continually. A little over 2 years ago, I taught myself to do an IV push. I had no luck finding (or affording!) Dr’s locally who would be willing to help. And I sure as heck wasn’t going to go back to BoBo the Circus Chimp who had administered it the first time. He clearly was hardly competent. And Dr Perlmutter was 2000 miles away. I want to share a video I made during today’s IV push for a number of reasons. But most importantly, I made it to show that you CAN do anything – even things you think impossible. Let us not forget: Your thoughts greatly affect your outcomes in life. Whether you think you can or think you cannot – you’re right. It’s up to you to decide which you choose. Personally, I believe I can. I will soon do another post with more in-depth information on Glutathione as well as other supplements soon. But for now, know that together we will all get through this. Please, if you have questions or would just like to drop me a note with your thoughts, please use the contact me page. Maybe Michael has always been gluten-intolerent. If he has, we hadn’t noticed in the past. You see we are from Chicago, so our diet used to consist of Pizza, Italian beef sandwiches, and Pizza. Then in May 2012, his neurologist, Dr Perlmutter, recommended a test for gluten intolerence. It came back showing that, in fact, Michael was very intolerent to gluten and that it must be cut out of his diet immediately. So I did what any normal mother would have done- open my kitchen pantry and cry at the stockpile of whole grain pasta, crackers, cereal, and the other many various kitchen staples that has built the American diet for the past couple decades, and that we could not eat anymore. Then I went online and to the library to research how to live gluten-free. Michael has been gluten free for months now- every once and a while I’ll tap into the gluten stockpile and offer a different meal to Michael than I do for Aedan because I don’t want the other food to go to waste. And I have to say, only good things have come from this change. Michael still has bad days where he struggles to get enough energy to walk across the house, but overall, the removal of gluten has lessened some symptoms. It is hard to quantify because his symptoms inhabit so many body systems but I can say that relatively speaking many things have improved. On the pain scale from 1-10 Michael often existed at a 7. Now he can say that he’s down to a 5. While still too painful for me, any improvement is monumental. His brain fog that caused him to sometimes walk about the house at a zombie’s pace has been upgraded from “zombie” to “tired person”. Most importantly, his symptoms are more…predictable…He knows that if he does too much or skips out on his supplements, his body will react accordingly whereas before it was more random. This new focus on proper nutrition is life changing for all involved. Pizza and Italian beef has been replaced by Kale and Roast Chicken. My scientific brain gets to enjoy the chemistry behind why the body needs certain vitamins and minerals. My inner child gets to be the “Swedish Chef” from the muppets as I make gluten-free bread from scratch. 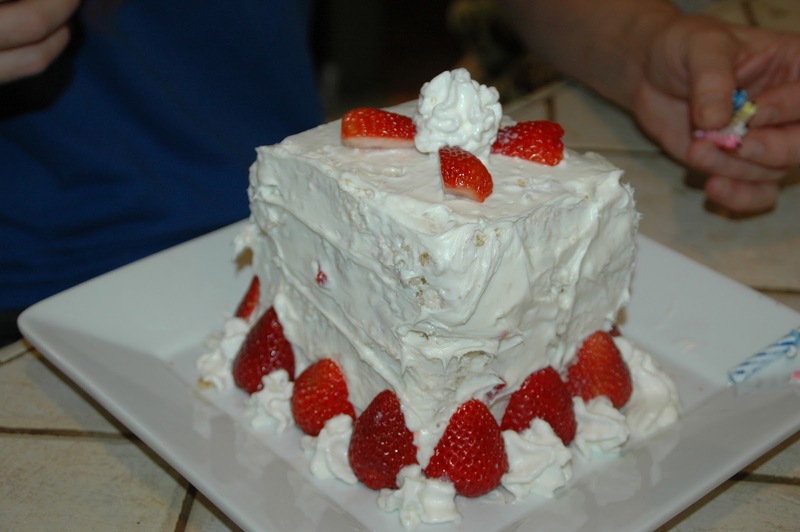 Gluten-free white birthday cake for Michael’s 39th Bday was the best cake I’ve ever tasted! In the end, I’m not surprised Michael’s body cannot tolerate gluten. For decades wheat starting being cultivated so that the strains containing the most gluten were in high demand because the American taste buds liked the gooey texture of high gluten wheat. It just doesn’t surprise me that the same culture that created these Frankenstein-like drugs also creates food that the body cannot process. Whatever turns a profit I guess. Only after decades of killing, maiming, and complete destruction of innocent lives (assuming they SURVIVE these drugs) only now are we really getting some news coverage. Face it, we generally have NO clue what Doctors are prescribing. By that I mean that we rarely ever know what these drugs truly do and what their TRUE side-effects are. IF that information is even available, it’s buried in the package insert that you’ll never see. What did we do to protect ourselves before the information age? Before being able to Google these things, we the people had NO way of knowing the side-effects of the drugs being prescribed. WAKE UP everyone. Doctors often have absolutely NO clue what these Frankenstein drugs they regularly prescribe do to our bodies. Take it from me. I have so far barely survived modern medicine. This is a link to original article by the NEW YORK TIMES. Below is the entire article. It’s about time the mainstream media shed light on the devastation these drugs are causing. Adverse reactions to fluoroquinolones may occur almost anywhere in the body. In addition to occasional unwanted effects on the musculoskeletal, visual and renal systems, the drugs in rare cases can seriously injure the central nervous system (causing “brain fog,” depression, hallucinations and psychotic reactions), the heart, liver, skin (painful, disfiguring rashes and phototoxicity), the gastrointestinal system (nausea and diarrhea), hearing and blood sugar metabolism.